The Social Media Handbook is a comprehensive risk and compliance management toolkit that walks employers step-by-step through the process of developing and implementing effective social media policy and compliance management programs that are designed to minimize—and in some cases prevent—social networking and web 2.0 risks and other electronic disasters. Throughout this important resource Nancy Flynn (an internationally recognized expert on workplace social media) offers a guide to best practices for creating safe, effective, and compliant electronic business communications. The book contains a thorough review of the risks inherent in employees' social media use and content and explores how organizations can help manage behavior, mitigate risks, and maximize compliance through the implementation of strategic social media compliance management programs. These programs combine written policies, supported by comprehensive employee education and are enforced by proven-effective technology tools. Once these policies and programs are in place employers can safely take advantage of the marketing and communications benefits offered by social media. Covering a wealth of material, the book includes vital information on topics such as social media and the law; managing records and e-discovery compliantly; regulatory compliance; privacy and security; blog risks and compliance rules; mobile devices drive social media risks; a seven-step plan for social media policy and compliance management; conducting a social media audit; creating social media policies; content rules and compliance; policy compliance and education; reputation management; and more. In addition to addressing pertinent topics on risk management, the book contains cautionary, real-life social networking disaster stories that show how organizations can lose revenue and reputations, reveals how employees can lose jobs, and explains how individuals can face public humiliation. 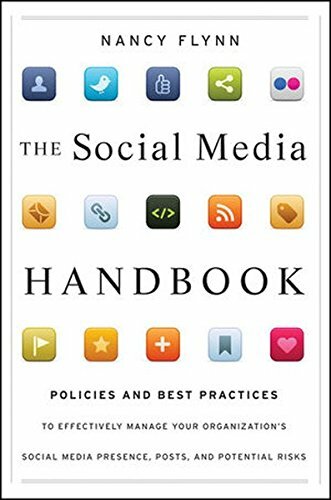 The Social Media Handbook is a hands-on guide written for human resource professionals, information technology managers, legal professionals, compliance officers, records managers, and others who need to manage today's technology tools with up-to-date employment rules.